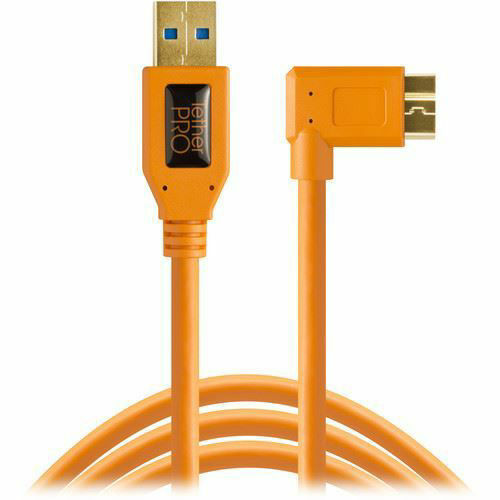 The orange USB 3.0 Type-A Male to Micro-USB Right Angle Male Cable from Tether Tools is 15' long and has a right-angle design that routes the cable along the device. This cable is suitable for transferring data and providing power to digital cameras or storage drives. It features a TetherBoost Core controller that boosts and regulates the power coming from a DSLR camera or a digital back system. This controller provides consistent power to maintain a stable, reliable connection. To reduce signal noise and transmission errors, the cable is fully shielded. Furthermore, Tether Tools has designed this cable with SuperSpeed USB 3.0 technology, so you can quickly finish the transfer job with speeds up to 5 Gb/s. Box Dimensions (LxWxH) 9.0 x 7.0 x 2.0"